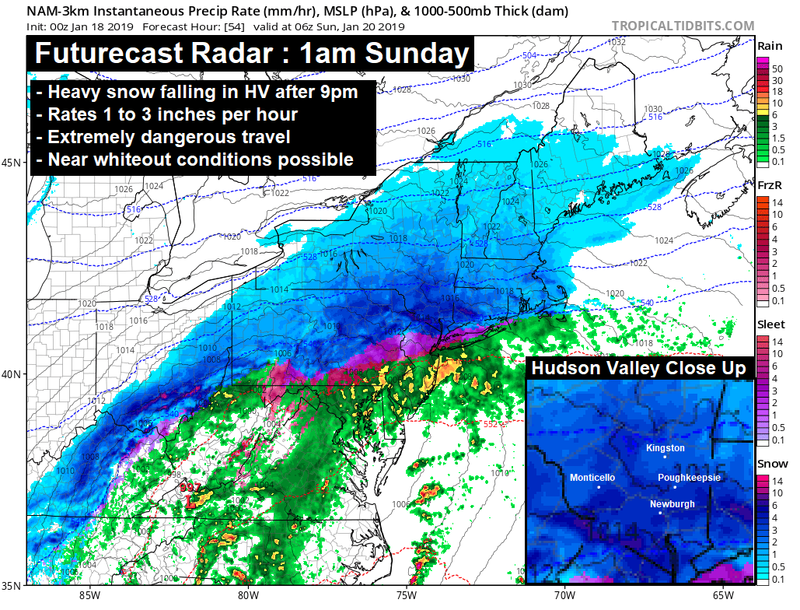 Our first significant winter storm in 2 months is taking aim at the Hudson Valley, and it has the potential to cause major disruptions to weekend travel plans. – Thunder snow cannot be ruled out as deep convection pushes into the colder air. Cold arctic air is approaching from Canada on Saturday. At the same time, the southern branch of the jet stream will be collecting moisture and a low pressure system, and pushing it northeast, into the Ohio Valley. The warm moist air will overrun the invading arctic air, and a textbook overrunning snowstorm will develop across the northeast US. The key to this entire forecast is the precise positioning of the arctic boundary, that this storm system will then travel along, and spread substantial amounts of moisture along its path. The trend in the last 24 hours, has been toward a colder solution… suppressing the arctic boundary slightly further south than suggested earlier. This is consistent with the ideas we’ve presented over the past few days, but we are finally seeing the models confirm the idea that the cold will be stubborn to lift out. Strong upward motion will generate heavy snow bands to enter the Hudson Valley before midnight Saturday night. This heavy snow bands, coupled with air temperatures in the upper teens and low 20s will result in snowfall rates possibly 1 to 3 inches per hour, of a light fluffy powder. The good news, is the latest guidance suggests that ice accretion will be less of a concern, if at all, for most of the Hudson Valley. The cold air should be deep enough, that even where mid level warmth turns the snow over to a wintry mix… that mix should be mostly in the form of sleet, and not freezing rain. Freezing rain is what coats the surface, and turns paved surfaces into skating rinks… as well as brings down trees and power lines. We’ll have to focus on the trends to see if this concern remains low. 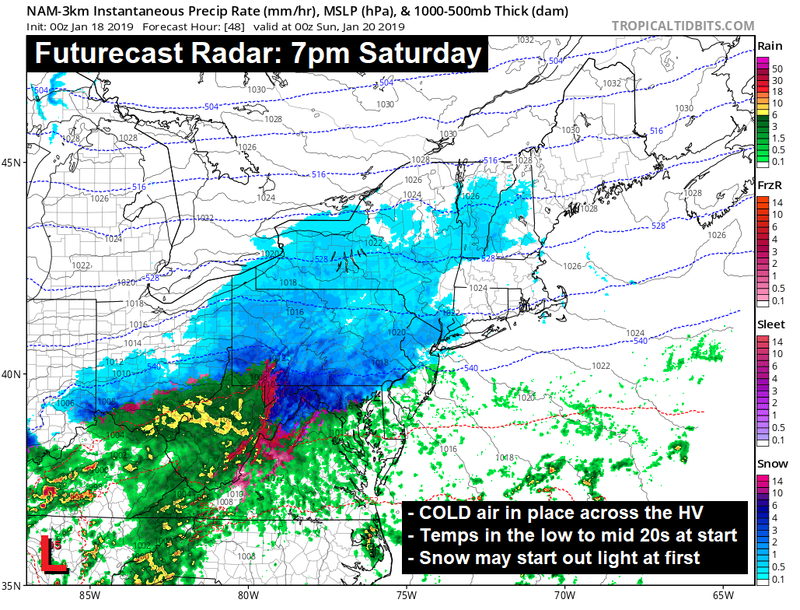 – While our latest idea suggests this concern may be diminishing… a prolonged period of heavy freezing rain with high amounts of ice accrual that may damage trees and impact power is possible across our region, this area looks to potentially be well south of i84. – Rapidly dropping temps on the back side of this storm will lead to a flash freeze. Areas where snow melts, or rain falls, will quickly refreeze into a sheet of ice, causing very dangerous conditions. Even where all snow falls, salt may be thrown on the roads to melt the snow… and that could flash freeze Sunday afternoon and evening. – Intense precipitation rates and stationary banding may lead to a band of overachieving snowfall accumulations. – We will likely see small corrections north or south in the track of the storm for the next 24 hours of modeling, this has large implications as any minor adjustment will cause corrections to where mix precipitation line sets up. We will continue to track the latest guidance as we get closer to the storm. 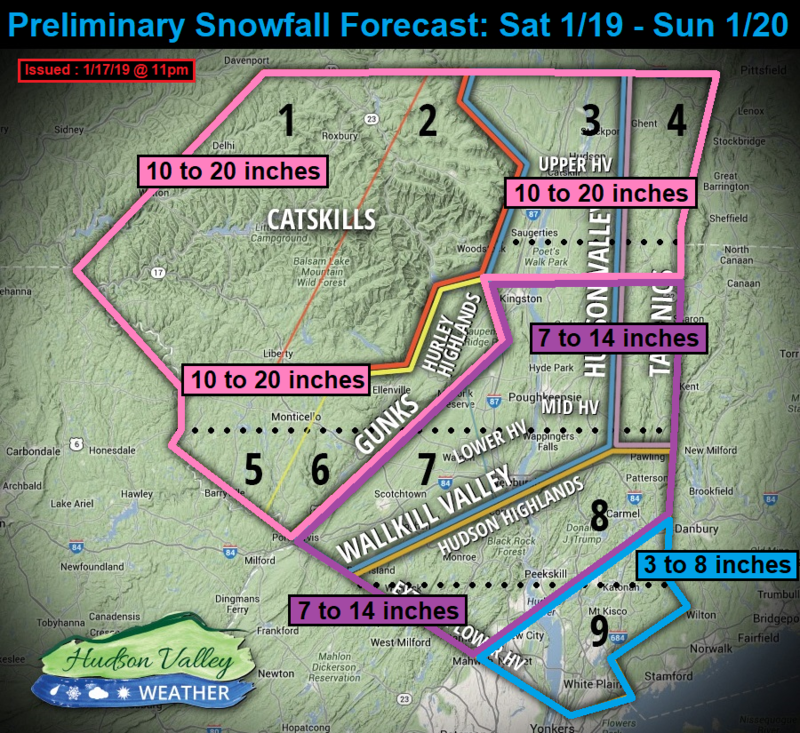 We anticipate releasing our “HVW Storm Forecast” around 11pm Friday night… with the “Final Storm Forecast” featuring any minor tweaks Saturday afternoon before things get underway. We continue to appreciate all your tremendous support! Thank you for being a part of the HVW community! Thanks for the heads up. We appreciate all the hard work you put forth nd also the accuracy. This timing doesn’t suit me at all. Kindly change this to late Sat. through early Sun. only. Thanking you in advance, – a typical Kingstonite. Thank you again for all of your guidance and work! I love to geek out on the details of these storms. Ugh!! Been living in the Hudson Valley my whole life. Tired of this weather. Time to move south. Great work guys. But can’t you predict light rain, temps in fifties, and sunny and warm all next week? Most of wouldn’t mind that! If we stop getting these storms all together, Im heading North. 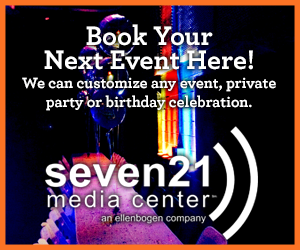 Bring on 20″+ Yeah! I love Hudson Valley Weather for its timely and informative forecasts. You guys keep us all informed and safe. Another good reason to live here. Thanks for the regular and detailed update…..Great news on the change from freezing rain but it will be hectic on Sunday PM with the flash freeze. Your work is truly appreciated. Never fails to amaze me how many people choose to live in NY and yet want no snow in winter. If only we had a huge country with lots of states and climates to choose from…oh, wait! Bring on the the storm, this true Upstate New Yorker is psyched! I just hope the chairlifts don’t lose electricity, and the lines are short. Your work is truly amazing, thankyou!! So grateful for the great storm forecasts!! Time to deploy snow abatement resources aand stock up on milk and bread!! 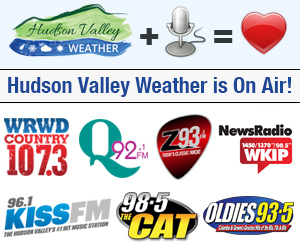 Love the snow…be safe everyone .thank you to hudson valley weather..
Really LOVE you guys!What’s worse for me is hearing second-hand weather reports from others(well meaning!) that may or may not be exaggerated and/or inaccurate.So you shed light and reason on an otherwise scary,unknown situation.My strong aversion to snow has been created by years of exhaustive shoveling,so I’m determined to get outside more and embrace the quietude and natural beauty the winter snow offers-to assuage the association with heavy manual labor. (Bird walks?Cross country skiing?Something! )I am very grateful for the service you provide!! Leaving Long Island early Monday morning for New Paltz..do you think it will be to icy ?